I awoke that morning to the unmistakable sound a body makes when it involuntarily crashes to the floor. The sound of a thud propelled me upright in bed, thrusting my heart into my throat. Through shadows, I could see the silhouette of Ted somewhere in the vicinity of his closet, trying to balance on all fours. "Are you all right?" I shouted as I vaulted toward him. Ted has always been a master of turning a mountain into a molehill. If ever there is a disaster or the need for someone to be calm in the face of danger, Ted is the man to call upon. I, on the other hand, especially at that time in my life, was panicked easily, and Ted had no problem reminding me of that. I was the insane one, not him. "I'm fine." He said. "I was just trying to find a position that might help me with my headache." To anyone else, this would probably send giant red warning flares through the roof of your home, but Ted is a physical therapist, and the authoritative manner in which he speaks, especially when speaking about his own body mechanics, always makes me feel like he knows best. "I think you need to see a doctor," I said, resting my hand on his back. "I'm fine. 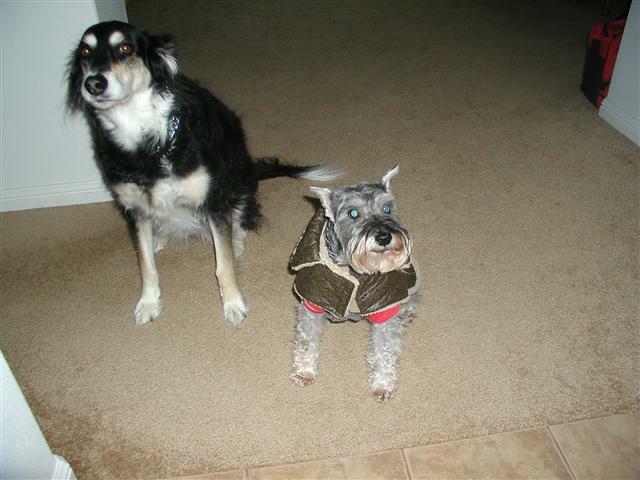 Let's take the dogs on a walk to see if I can shake this thing." This 'thing' as he called it had been plaguing him nonstop for two weeks. It was a stabbing headache on the right side of his forehead. He blamed it on a bad dental appointment and was convinced the dentist was an active member of a sadist club. "Our insurance runs out today," I reminded him. "I think you should see someone." "Don't worry about it." He stood up and moved toward the shower, "I'll be fine." Ted had been fired two weeks before. He'd spoken his mind to a boss. This was becoming a recurring theme in our lives, and I was at a loss as to what to do. It was the third time in two years he'd been fired. Increasingly, he was becoming more belligerent and intolerant of other people. Going out in public with him was becoming difficult. He would voice what was on his mind, unconcerned with other people's feelings or the consequences of his actions. I asked him if he was depressed, but he insisted he wasn't. "What have you done with my husband?" I once asked him. A bewildered look crossed his face. "I don't understand," he said. The sad thing was, he didn't understand. As he entered the shower, our phone rang. It was my mother. I told her what had happened. She reset my sanity alarm and insisted that Ted go to a hospital, or at least make an appointment with a doctor as soon as possible. She was right, but I didn't know how to force a six foot three, 175 lb man with an increasingly unpredictable attitude into a car and take him to a hospital. I hung up the phone, took a shower and dressed for our walk. Ted bundled himself in multiple layers. It was spring in the Pacific Northwest and the weather can be unpredictable, but he was dressed for an Alaskan winter. 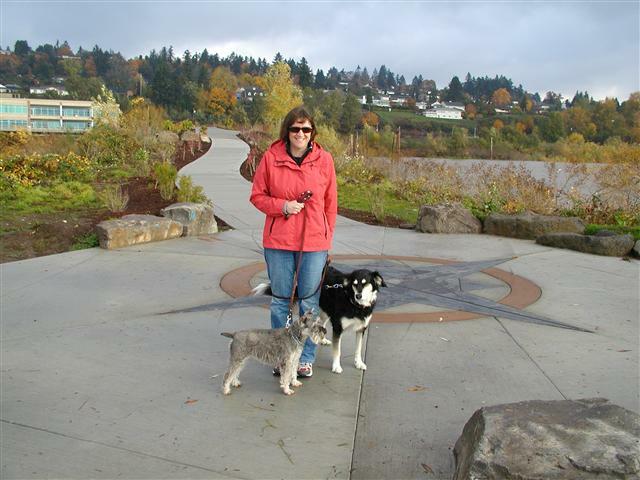 We put our dogs, Silvi and Morgan, into the car and headed for our favorite urban hike, the Renaissance Trail along the Columbia River in Vancouver, Washington. "I don't know what's wrong," he said, but this time his voice was weak. The bold assurances were gone. "I'm taking you to a doctor right now!" I demanded, and for the first time, he gave in. 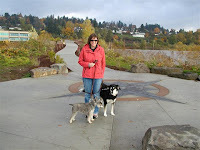 Our house was on the way to the nearest medical facility, so I dropped the dogs at home, and we drove to Salmon Creek Urgent Care. The first thing the doctor noticed was the unusual amount of clothing Ted was wearing. "I guess so," Ted shrugged. "You don't take drugs do you?" The doctor asked. Ted was tall and too thin, and he was layered in too much clothing. He had a crazed look in his eyes. I think the doctor thought he was a meth addict, not an uncommon sight in this part of the world. "No," I assured him. "He never takes drugs, not even the prescription kind. " "When did the headache start?" The doctor asked. Ted went into a diatribe about his recent visit to the dentist from hell. The doctor interruped him and looked at me. "Has he had any personality changes?" I surprised myself because without hesitation, I said yes. It was the first time I had said it out loud and the first time I acknowledged it to myself. There had been something wrong for a while, but I couldn't quite put a name to it or understand what was happening until that moment. Once I heard the words, "personality change" I felt like I'd gotten a question right on a game show. It was as if I had clarity for the first time. I wasn't even sure what I was clear about, but the fact that there were two simple words to describe what was going on with Ted emotionally, made a difference to me. It was as if I was getting one step closer to solving a mystery. "You need to take him to an ER," the doctor said, "and don't let him leave there without a Cat scan. Make sure to tell them he's had a personality change. If they try to give him pain pills and push you out the door, insist he gets a Cat scan." With the doctor's assertive words ringing in my head, I drove to the nearest ER. After several hours in the lobby, Ted was finally called back. He was poked, prodded and scanned. Just as the urgent care doctor had ordered. It had been eight hours since I dropped our dogs at home. They would be hungry and in need of attention. We had only lived in Washington for two years and had almost no friends I could call upon, partly due to Ted's aggressive attitude . I thought about going home to check on the dogs, even if it was just long enough to feed them and return to the hospital, but I was compelled to stay. The hospital was clean and modern. Each patient had a private cubicle, separated by an actual wall, but there was no door to the room, only a curtain that hung from little metal ringlets. The kind you find attached to a shower curtain at Home Depot. I'll never forget the sound the metal made as the pretty blond doctor threw the curtain open, a fabric door that separated our old life from our new one and proclaimed to Ted that he had a brain tumor. She said it with such casualness that Ted thought she was joking, but my mystery was finally solved. I was horrified and oddly relieved. There was a reason for Ted's behavior, and it was beyond his control, but at this point, there had been no verdict on the type of tumor he had. We wouldn't find that out until after its surgical removal. 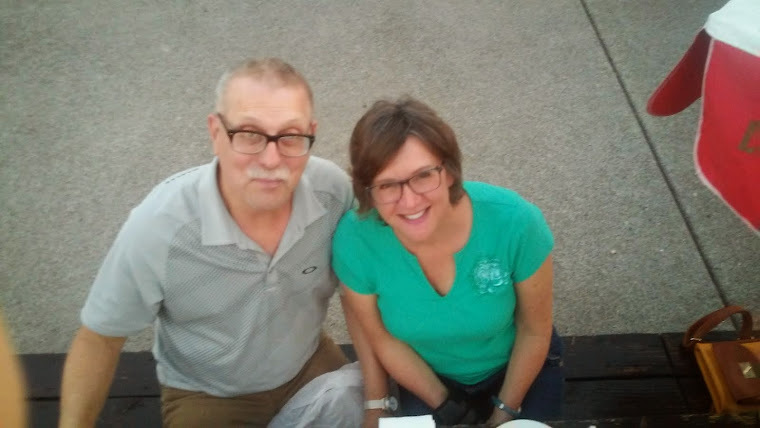 Note: For those concerned about mood changes with brain cancer patients, Ted returned to his normal loving self as soon as the tumor was removed. It was the tumor and the brain swelling that caused him to become Dr. Jekyll Mr. Hyde. As soon as the tumor was removed, he returned to his old self, a loving and caring man. Wow...that was kind of what I went through with my husband a year before we found out he has brain cancer" Personality changes "
Fortunately, after Ted's surgery, his mood swings disappeared. The doctors warned me that he might have even worse mood swings, but that never happened. He is his old cheerful self again. This is the first time I have heard a story so close to what I went through. My husband is now 62 and was diagnosed with glioblastoma 3 years ago. The change in his personality was so small and I thought it was because he was tired from teaching high school all day and running for local government at night. I also had to cut the grass, etc.Your whole world changes. Lucky for us we have family that is supportive. But they can not give you your life back. Thank you for sharing. It really helped.